Blue Sky Recruitment are a New Zealand recruitment agency with a difference. Michael Beaton and his team of experts focus on long standing recruitment partnerships. By investing the time to fully understand their New Zealand clients goals, they’re able to provide ongoing team enhancements to continuously contribute towards their growth. 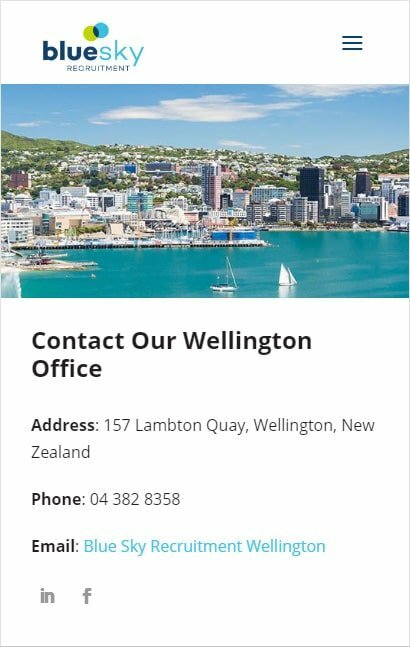 Although all of our New Zealand web designs are mobile friendly by default, this was an important area for Blue Sky Recruitment to focus on. With a mobile friendly web design, Blue Sky Recruitment are now sending the right message to their clients. One that shows that they care about their clients every interaction with their brand. That their clients time is important, and that they are in a position to be flexible to change, as their clients dictate this. Their refreshed website is now easy to use, no matter which device or browser is being used. Blue Sky Recruitment offer their candidates the opportunity to search and apply for New Zealand jobs online, directly from their website. We integrated their Job Adder recruitment system directly with their website. This integration offers New Zealand candidates an engaging experience with the brand, as well as an incentive to return regularly. One of our project goals, was to help Blue Sky Recruitment increase their visibility online. To help them grow their business, by reaching a wider, meaningful audience. To help them achieve this SEO goal, we implemented a unique SEO strategy, which included efforts to retain their current SEO position. The website redesign needed to account for any existing exposure Blue Sky Recruitment already had online – in case you’re wondering, no, this doesn’t happen by default. By carrying out Google’s best practises in this area, we were able to leverage their existing visibility, while improving their overall position too.